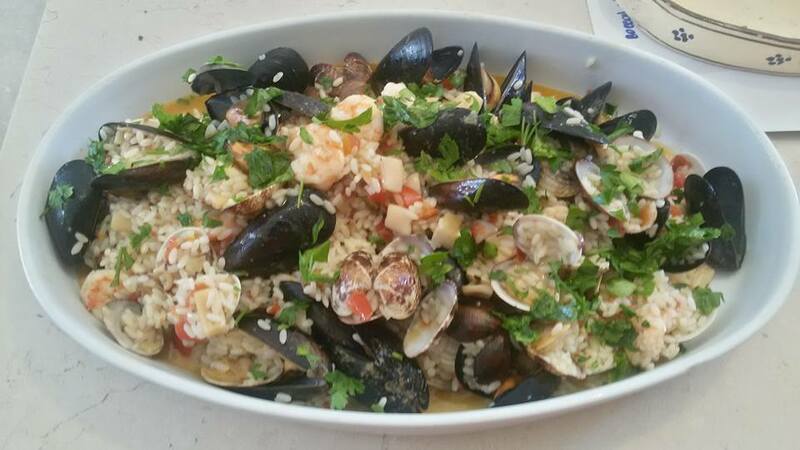 This classic Puglian spin on seafood risotto is a guaranteed crowd-pleaser, and a recipe you’re sure to find on our cooking holidays in Puglia. Why not try it out at home for your next dinner party! Boil the vegetables (onion, celery, carrot, tomatoes, potatoes, chard) to make the vegetable broth. Put the clams in salted water for one hour to flush out any impurities. Clean the squid and cut into small pieces along with the cuttlefish. Chop the onion and garlic finely and fry them in plenty of extra virgin olive oil. Meanwhile, wash and chop the tomatoes into large pieces. After 15 minutes, add them to the pan. Cook the tomatoes for about 10 minutes at a medium heat. Add the clams, mussels and the prawns and one glass of white wine and let it cook until the clams and mussels are open. Add a generous pinch of salt and pepper to season. In a separate pan, heat some extra virgin olive oil and a piece of butter. Add the rice and fry slightly, turning it with a wooden spoon. Add the remaining white wine and let it evaporate. Continue occasionally adding ladles of vegetable broth, stirring often, until the rice is cooked but ‘al dente’. Put the rice in the marinara sauce (with the mussels, clams, squid etc) and stir everything together, adding more wine if the rice is too dry. Stir in the cheese and cream. Add some salt and pepper if needed and serve the risotto with some chopped parsley sprinkled on top.